Cool spray paint art on the Embarcadero! – Cool San Diego Sights! Cool spray paint art on the Embarcadero! I took this fun photograph near Anthony’s Fishette. 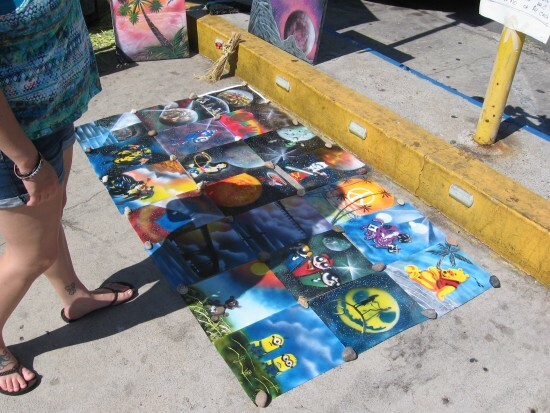 A spray paint artist had placed these colorful pieces of artwork out for passersby to admire and hopefully purchase. These appear to be smaller renditions of the more elaborate “space art” productions that I’ve seen in the past. In addition to a few cosmic planets, I see several outlines of the Coronado Bay Bridge, a Buddha, a Mario, a skull and crossbones, and a variety of cool faces. I really like how these images, weighed down on the sidewalk with small rocks, combine in a fantastic mosaic. The colors are intense and the effect is bold! Someone checks out space art on the sidewalk. 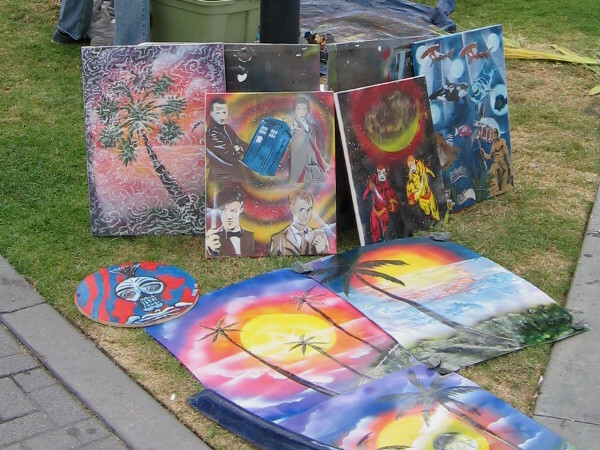 I spotted the same artist displaying his work on some grass near the convention center during 2015 San Diego Comic-Con. I learned his name is William J. Dorsett. Cool guy! Check out his Mind Magick Creations website! The work of William J. Dorsett displayed near the convention center during 2015 San Diego Comic-Con. 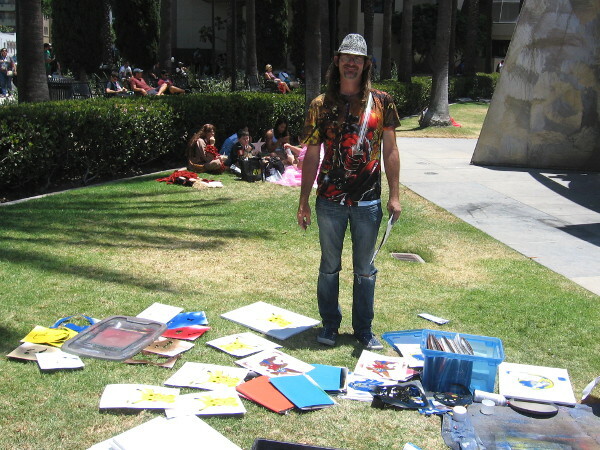 A local artist shows his stuff outside 2015 San Diego Comic-Con! Enjoy future posts! Join me on Facebook or Twitter. Previous Previous post: Big crowd at San Diego’s 2013 Festival of Sail! Next Next post: Kid musician street performers by USS Midway.